Benrinnes Distillery lays on a summit that overlooks the lower Spey Valley, the mass of the Cairngorm Mountains and to the north, the sweep of the Moray Firth, with distant Easter Ross and Sutherland hills beyond. Ben Rinnes mountain range (spanning nearly 50 square kilometres) gives its name, albeit as one word, to the distillery. In its early years, it started out as part of a farm, with various outhouses being converted into stills. It was rebuilt as a distillery when the buildings were destroyed during floods in 1829. Benrinnes underwent a second make-over in 1955 and the traditional floor maltings were replaced by a so-called 'Saladin Box' in 1964. This is a giant flat box that mechanically turns the germinating barley inside and allows air to pass through it. The Saladin Box (named after its inventor Charles Saladin) was removed again in 1984 when Benrinnes stopped producing its own malted barley. 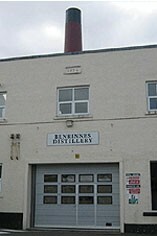 The distillery has enjoyed almost continual production, aside a brief closure during the two world wars. The single malt is highly acclaimed by blenders. 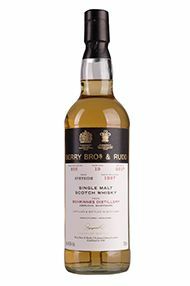 Its partial triple distillation makes it one of the most individualistic malts in the Diageo (its current owners) portfolio. 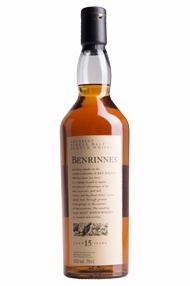 Benrinnes 15yo shows a distinct cereal character, shredded wheat, hay, wet earth, followed by a blast of vanilla flavours. Some fruit syrup and citrus peel on the finish. A Benrinnes distillery has existed in the vicinity of Benrinnes since 1826, although the first buildings were swept away by floods in 1829. A further blow in 1996 saw the stills destroyed by fire. The Whisky is produced by a triple distillation which adds complexity. Deep, nutty aromas dominate initially. There is a jammy, intense fruit that emerges to give quince and bruised apples. The palate is unctuous with bags of apples, yellow fruit and a hint of peat. The finish is long, lingering, sweet and spicy.